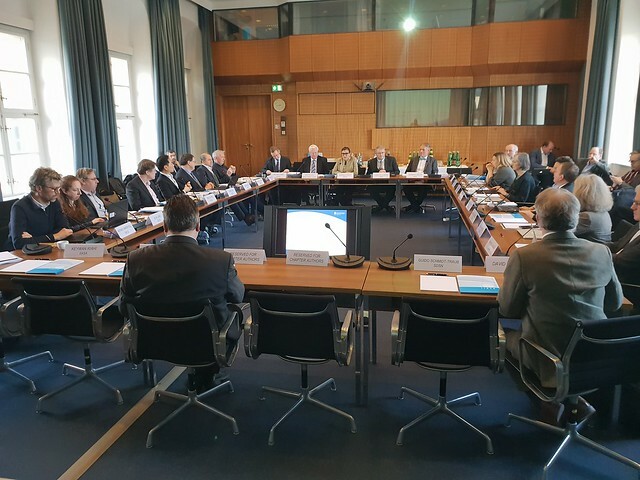 A high-level delegation from the Organisation for Economic Co-operation and Development (OECD) visited IIASA for the second meeting of the IIASA-OECD Task Force focusing on systems thinking, anticipation, and resilience. The delegations were led by IIASA Director General Albert van Jaarsveld and OECD Chief of Staff and G8 Sherpa Gabriela Ramos with the Task Force Chair Martin Lees. During the meeting, the task force reviewed on-going IIASA-OECD collaborative activities and defined priorities including the formulation of systems-based strategies to address global issues, disseminating systems thinking through education and training, and extending the systems approach across the OECD. The mission of the OECD is to promote policies that will improve the economic and social wellbeing of people around the world. This second task force meeting between the OECD and IIASA further consolidated a strong history of mutual collaboration and strategic partnership with the aim of applying systems thinking to improve the quality of people’s lives. The OECD has its beginnings in the Organisation for European Economic Cooperation (OEEC) , which was established in 1948 to run the US-financed Marshall Plan for reconstruction of a continent ravaged by war. By making individual governments recognize the interdependence of their economies, it paved the way for a new era of cooperation that was to change the face of Europe. Encouraged by its success and the prospect of carrying its work forward on a global stage, Canada and the US joined OEEC members in signing the new OECD Convention on 14 December 1960. The OECD was officially born on 30 September 1961, when the Convention entered into force.